1. Drain the tuna, keeping the oil for later on. Mash the fish then mix with the crumbs, olives, eggs, half of the parsley and seasoning. Shape into 20 balls, then set aside. 2. Heat 2 tbsp of the tuna oil in a frying pan, then add the tuna polpette and fry for 5 minutes, turning a few times, until golden. 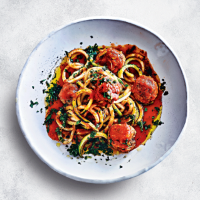 Nestle the courgette spaghetti among the balls, sizzle for 2 minutes, then spoon in the sauce and 4-6 tbsp water. 3. Simmer for 2 minutes, scatter with the rest of the parsley and finish with a drizzle more oil, if you like. Delicious with hot slices of essential Waitrose Garlic Baguette on the side. Cook’s tip Reduce waste – keep the remaining tuna oil in the fridge for up to 3 days and use for cooking fish dishes or in salad dressings.